It seems Google are poised to take over the..... fashion world? 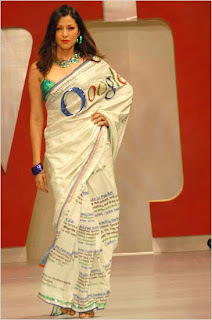 Well perhaps not, but oogle FashionSatya Paul an Indian fashion designer has created this original Google saree. Trademark issues I hear you call! Well to avoid any trademark issue with Google Satya has just put an O there instead of G.